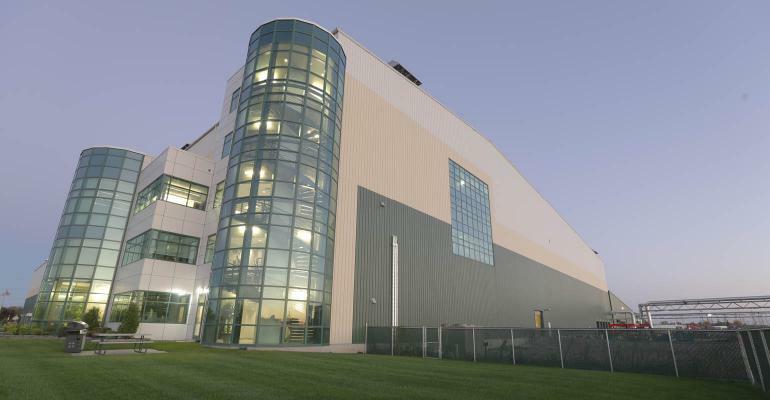 Greenpac Mill is a new state-of-the-art Linerboard mill in Niagara Falls, NY, recognized for its high tech equipment, sustainable manufacturing processes and high performance work organization. Greenpac Mill manufactures lightweight linerboard, made with 100% recycled fibers. Greenpac is the biggest project ever managed by Cascades in its over 50 years of existence. Thanks to numerous technological advances, Greenpac Mill manufactures one of the best linerboards in the industry and is a leader in terms of sustainable development. Construction of the Greenpac Mill began in the summer of 2011. After several months of demolition and excavation, the foundations were cast, the steel structure was erected, and the roof and walls were built. During the construction of the outer shell of the building, several pieces of equipment were installed inside. More than 300 workers worked every day on the construction site for the mill to be ready to manufacture its first linerboard roll on July 15, 2013. At Greenpac, we believe in a foundation firmly rooted in four key concepts: Safety, People Development, Operational Excellence, and Profitability. We believe that if we value and concentrate on each of these things in partnership with our team members, we will be a successful organization.